This Edwardian Villa was built over a hundred years ago and exudes and aura of understated English country elegance. Breakfasts are served in the open plan kitchen area, while in summer guests eat in the glorious garden or beside the pool, with wonderful view of Rhodes Memorial in Cape Town. The hospitable well travelled owners have a keen interest in wine and besides an interesting collection of wines, have planted a small Shiraz vineyard beside the boule court. The guest house is ideally situated within walking distance of Newlands rugby and cricket grounds. A 10 to 15 minute drive to either the airport or the centre of Cape Town and waterfront, and just further 10 minutes to the beautiful beaches of Camps Bay and Clifton. For the keen golfer there are several golf courses with 5km of Brooklands House. Kirstenbosch National Botanical Gardens is only ten minutes drive and both Newlands Rugby and Newlands Cricket grounds are within 20 minutes walk. Brooklands House now also has a 14 seated conference room. Our Brooklands room with two single beds, prints and paintings of racing in the 30's. Shower and bath en-suite with heated towel rail. DSTV, mini bar, hair dryer and emergency lighting. Honeymoon Suite with curtained four poster bed, small lounge area with views of the swimming pool and Rhodes Memorial. Bath en-suite with heated towel rail. DSTV, mini bar, hair dryer and emergency lighting. 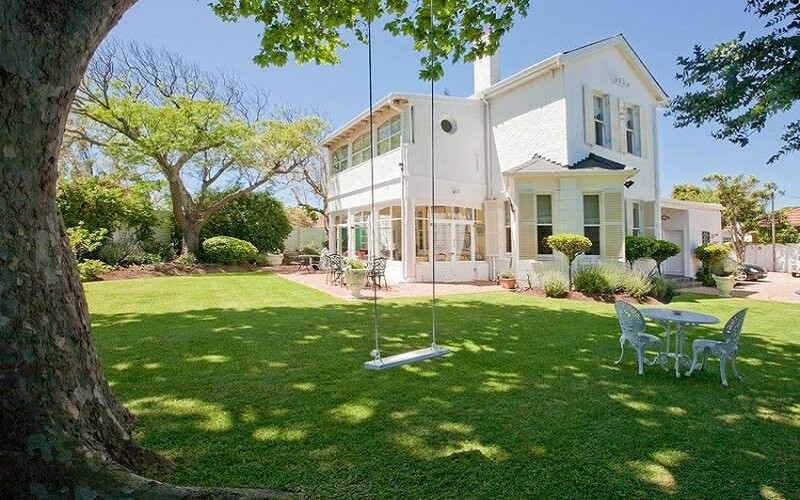 A large sunny room overlooking the garden with original paintings by Derek van Rensburg. Queen size bed, lounge area. Shower en-suite with heated towel rail. DSTV, mini bar, hair dryer and emergency lighting. A standard double room with lots of sun in the mornings, arm chair and desk, shower en-suite with heated towel rail. DSTV, mini bar, hair dryer and emergency lighting.